There is a new visible 3D model /9 . It has to be scaled yet. 1. Create and upload Zip-file. * Put all the files on one ZIP file. Do not use any path, just a flat list. There mustn’t any path in the MTL file to! * If it is a uniq object, set its position by map or values. The GPS position is NOT the position used by the renderer, only to find repository models in an given bounding box. * A model like a bench should have its origin at the center, to make rotation possible. To adjust this, you may set the offset origin values now or later by testing it out. The meaning of the 3 values are: with/right , dept/back , elevate up. Their unit is the models unit before scaling, not afterwards in Meter. * The rotation value may be needed to let the modes direct to the expected side (like a bench is directed to the view you have, if you sit on it. All instances of i.e. a bench should have its direction tag. So both values later are added by the renderer. The direction tag may also be “along” to place a bench along the nearest way it is placed to. * A unique model like the Eiffel Tower may only use the repository value. * Multiple used models like a benches usually placed by an OSM Node. So just add the Tag “3dmr” = “id-number” (or uuid, mesonic name, in discussion) For objets like a bench, an Tag “direction” is recommended. See the wiki page for all the options. - The default symbol or object, the Node usually is shown will not get rendered but replaced by the model. * A model may also be tagged to an OSM way, like a “building" or an small "amenity". Never on open ways? How is the “center” of an area calculated? All renderers should use the same algorithm. Maybe we need an pseudo code for it. If it is a unique used model, the origin Metadata may fit the model to the right place. - The default object, the Way usually is shown will not get rendered but replaced by the model. That includes all building:parts inside this area, partial to? * An OSM relation is NOT adequate to place a model because it does not have a defined position. But the “outer” member as an are is fine. In this case, all member objects of the relation will not get rendered but replaced by the model, also including building:parts. If the area, a relation covers does not fit to the model, the model should be divided in multiple parts, an extra relation for a model should be avoided. * Depending on the data refresh cycle of the used 3D renderer, that may be a view minutes with overpass, the model should now be visible. * Changing the Metadata in the repository should be valide at once. Refresh the rendering (mind the cache!) and repeat this until the model is placed accurate. The 3D renderer may provide an interactive fine-tuning of the model and set direct or show you the values to edit into the metadata. Now scaling is also posible. Next to the Name.dae will be a folder Name with the textures. If you check the log output of OSM-go you will see a lot of warnings because the texture sizes are not Power-of-Two. It works anyway. To be perfect, resize the textures to the values of the warnings before you ZIP the model. Login is broken? After Logging in by OSM, I get Error 500. 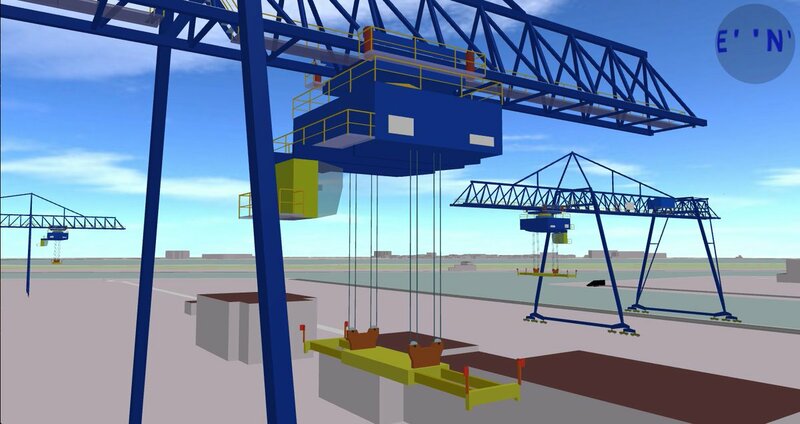 From my friend Martin, I got a small container-crane and uploaded it. Th moving parts are missing yet and will follwe. 3DMR does not support moving models yet (windmills, London Eye, etc. 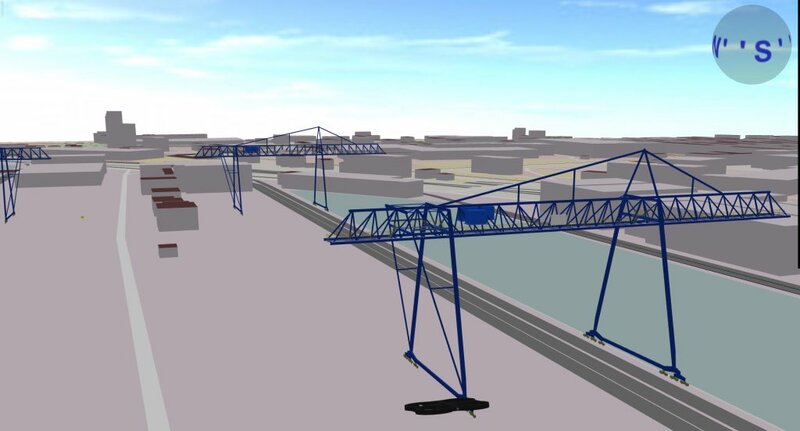 but also moving sequences like building site cranes etc. That may be done one day to. The tagging of the nodes just did say: container crane, no size, no type nor the company it was build. But because it is not at a see port, it most probably its a small crane, not a big container crane for oversee ships. In theory, any node, tagged the same way could be replaced by a crane model without the 3dmr-tag. Well, you need some AI to find the water border and adjust direction and position this way :-o Yes, I am dreaming. For now it should be done manually. Overpass does show uns quite a view cranes as candidates. Adding the tags is done quickly. Even the direction is easy to set by iD. Only the position is a problem. May be we should set the 0.0 point in 3DMR to the water border? No that would mean to shift all notes to this point to. In OSMgo is a nice function to find the coordinates for 3DMR. It also should be able to find the needed lat/lon for the node. I'm thinking about the possibility of integrating a 3D renderer that works in the browser (such as OSMgo) into the upload model and edit model forms to set these values, so that they're easier to fill. That would be reasonable. It could be a simplyfied version of a renderer & editor. Even the latest http://vrmap.kairo.at looks good for this. The direction tag may also be “along” to place a bench along the nearest way it is placed to. The direction tag isn't just used for 3dmr – it's a popular key used by quite a few applications. So I believe we should follow the existing rules for the tag instead of using 3dmr-specific values. So far, "along" is not an established value for direction. I think 3dmr models could be linked to open ways in some cases, e.g. for bridges or even an unusually pretty/remarkable barrier=wall. Edit your own 3D model or find a good one. In this case clarify the copyright! Make sure that you have the right to publish the model under one of 3DMR's licenses. This usually means that you created the model yourself or that the author gave you explicit permission. Models found online are rarely suitable for 3DMR! Also make sure that the same applies for the textured used in the model – textures from proprietary sources such as Street View cannot be used. Direction: A bank to sit on usually faces to the way, next to it. We should have a tagging for this. May be I did see it as roof:orientation. Next to direction we could support the tag orientation=parallel/opposite/etc., or whatever you like. Please make a recommendation. Open ways: Bridges are a good argument. So we should have Ways, open or as arrays. But we also must have a definition, how the resulting point is calculated! NEXT? I was happy to see, the HTML-Error 500 got fixet. This project seamed almost abandoned. There are some todos (documentation, discussions) but no activities, sadly. As a last contribution, I am just in an dialog about including a small 3D renderer into the server (rather not OSMgo), to solve the idea of @n42k. Some days ago I noted a new model in 3DMR, but no tag in OSM. So I send a message to the uploader. But the process seems to be to complicated, even with the description I wrote (see above). So he invided me to upload and place all his models. Well, that's not the way we intendet but I did it one time to check the process: It is ok. But I can't help with the uploads he did. May be we should enable edits of metadata to any model after any login as it is with OSM tagging. In this case, even the ZIP is not ok (textures don't work). Do we need some "Superuser" logins? A minimum of code should support just the needed functionality. At the moment, it is a 2D ground map with 3D buildings and threes. We could drop the trees or ad more. 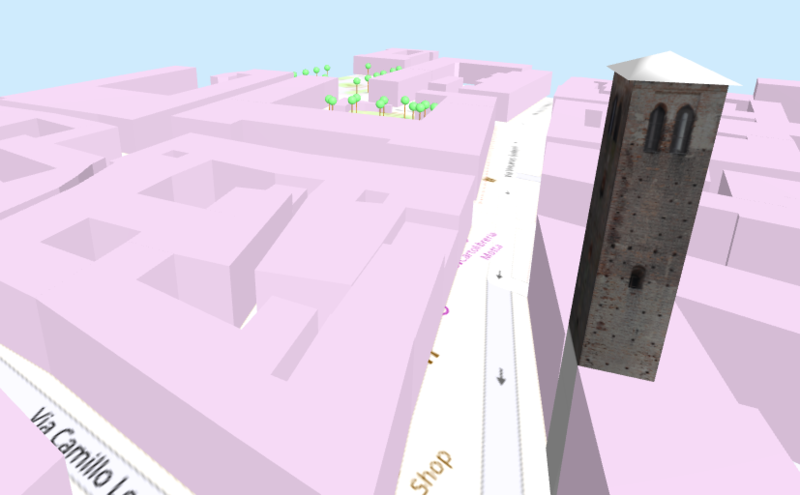 And the model of corse, placed as it would be in all OSM 3D renderer, using 3DMR. Next to the visualisation, the only function is, to move and rotate the model for fine tuning. The arrow keys (and WASD) should move it. What shall be used for rotation? I think, only the model should move. But the camera could be bound to the model and move with it to. We may start with this and use it. If we miss functions, they may be added. The GPS lat/lon, given in the model metadata are only a raw position. And there may be more than one tagged instance! An overpass query should be used to find the OSM Nodes and Ways with the Tag “3dmr” and the ID of the model. This instance(s) may be shown in 3DMR in the models Map-View. I could change the code of 3DMR. But I never have used GIT and will do it, if some one supports me. A marker in the Map may be used to select the model instance for visualisation and fine-tuning. The A-Frame tool will now get the valide lat/lon values and the model ID. It also will geht the Node or Way ID. This way, a 3D Building, replaced by the model will be hidden. A user of 3DMR, if logged in, may now moved the model to the exact place. This will change Origin an Rotation or the lat/lon and direction tag of a node. The new model metadata or the OSM tag will be set by a “Save” button (next to “Cancel”). The View will return to the model page of 3DMR. This page shows the plain model in 3D. We may implement, it to show the model by the A-Frame tool. @all: Please check my concept, comment it and tell mistakes, I may have done. There will be more to be defined later one, like how to find the model position if a way is tagged by “3mdr”. But fist steps first. Since my last reply, I've improved 3DMR, namely improving the load times of the pages, by preloading the required models, inlining CSS, and using a minified version of the THREE.js library. This is already live on https://3dmr.eu. Other changes include fixing the insecure page on models with a map, and small programming style fixes. Currently, I'm working on validating the uploaded models server side, so that new users get a friendly error when a model they uploaded is not set up correctly (such as invalid OBJ or MTL files). This will still take some time, as there is currently no library available in Python for opening OBJ files in zips directly. Furthermore, I've gotten permission to import some of the models that were uploaded to the now defunct OBM (https://wiki.openstreetmap.org/wiki/OpenBuildingModels). I will have to write a script to iterate through all the models and fix certain aspects (such as applying a translation to the origin for each building). What shall be used for rotation? I'd find it intuitive for the Q/E keys to be used for rotation. An overpass query should be used to find the OSM Nodes and Ways with the Tag “3dmr” and the ID of the model. This instance(s) may be shown in 3DMR in the models Map-View. I could change the code of 3DMR. But I never have used GIT and will do it, if some one supports me. I like this idea, seems better than our current approach, I'll have to discuss it with Tobias. I'm more than willing to help you with git in real time, you can find me on OSM's IRC. We could start with a simpler feature too, such as the one you suggested in the issue tracker (https://gitlab.com/n42k/3dmr/issues/4), to get you acquainted. Sounds sensible. I agree that there might still some confusion on what the lat/lon and origin fields should be, as different values for these fields will still work. Models should be centered on the origin when they're uploaded. If that's not possible, that should be fixed with the origin attribute. No other changes should be done to this attribute. For positioning the model in OSM, the lat/lon attribute on the corresponding OSM element should be used. Agree! Hope to find you on IRC. We can talk about the function details like keys. And if it is fine, we start merging into you repository. * Slide the viewpoint by arrow-keys, shift to rotate. PgUp/Down or +/# to elevate. 0 to reset. Mouse and Touch are disabled at the moment. @n42k You did close my merge request. Is it ok? Running? Seems not to work. * Slide/rotate the model by WASD/QE. Elevate by RF. Scale by TG? O to reset. Good work, it's a starting point for a proof of concept. The F key might not be the best idea to elevate, as it fullscreens the application on Google Chrome.